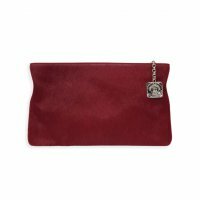 Red pony-effect natural fur clutch bag and Silver-coloured metal zip fastening and accessories. Interior in Camel suedette with a leather patch pocket. Shoulder strap (length 120 cm) with adjustable chain in Silver-coloured metal, to be worn long or short.